Last week, EDSBS suggested a roll-able, robot Jimmy Rane could fill the celebratory void at Toomer’s Corner. 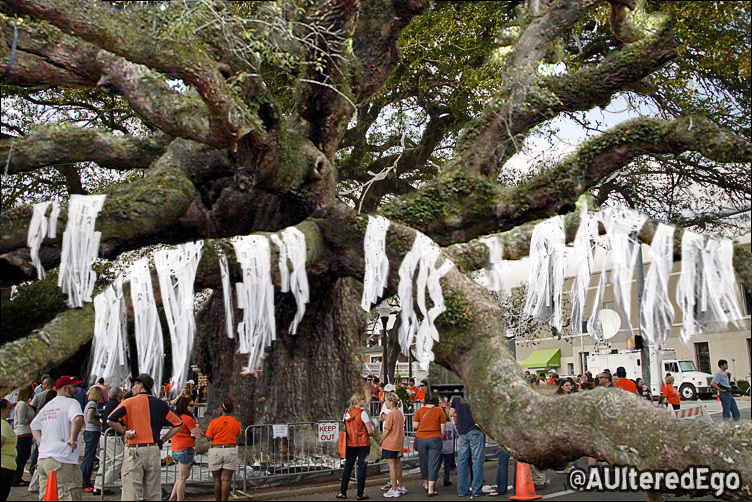 The Committee to Determine the Future of Rolling Toomer’s Corner would have welcomed the idea. In fact, included in the sample of suggestions printed in the report recently released by the committee, amid genuine horror at the prospect of some sort of tree sculpture–and genuine fear that Bama fans would strike / Spike again if real trees got the go ahead–there was a seed of something kinda sorta similar, something incapable of being Spike’d, something impervious to mockery (because if you mocked it it might morph into a tiger or a pressure-treated 2×4 with a little yellow tag or a Death Blossom-equipped Gunstar and kill you). The idea didn’t receive much play at the committee’s last meeting, but this is totally the way we should go: Transformers. You may have killed the Toomer’s Oaks, Al from Dadeville, but you will never kill TOOMERUS PRIME! Believe in work—hard word, Auburn engineers, and make this happen. The legacy of Robo-Nova demands nothing less. You know, considering the Bama fan base, I figure it’s only a matter of time before one of those jerks decides to try and shoot the War Eagle, if possible during a pregame flight, or if that won’t work, poison it, aka Harvey. Considering that Harvey the Tree Killer and the sexually confussed New Orleans Krystal Teabagger are probably representative samples of the Bama Nation (if you don’t believe it tune in the FineBama show in the afternoons), there must me thousands of other rabid, obnoxious Crimson loonies out there wanting to do their part of the old Crimson Tide. Let’s face it; unfortunately the Loveliest Village exist in a State filled with lunatics and the insane asylum isn’t the safest place for the sane to exist! I think that bronze trees emulating the oaks would be wonderful. Costly, but wonderful.